The board holding everyting was laminated with a photograph taken on board the USS Constitution anchored in Boston Harbor. This weird spring device obviously serves some specific purpose; I have no clue. It reminded me of a interesting piece of twisted metal Mark St. John gave me from his metal shop. I painted it, mounted on a scrap of copper sheet. 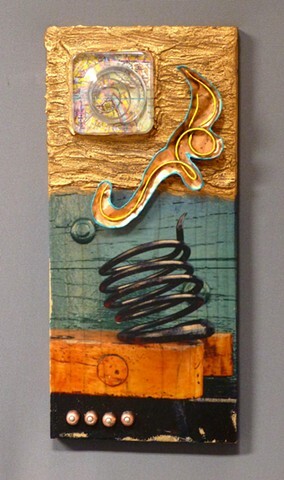 I found another more spring-like piece from Mark and incased it in plastic over a piece of map of downtown Vienna (near the Ferris Wheel), covered it with a blister from a clock mechanism, glued it to the wood then filled in around it with a coat of indoor tile cement, which I coated with gold paint. The twisted metal assembly was added to complete the group.